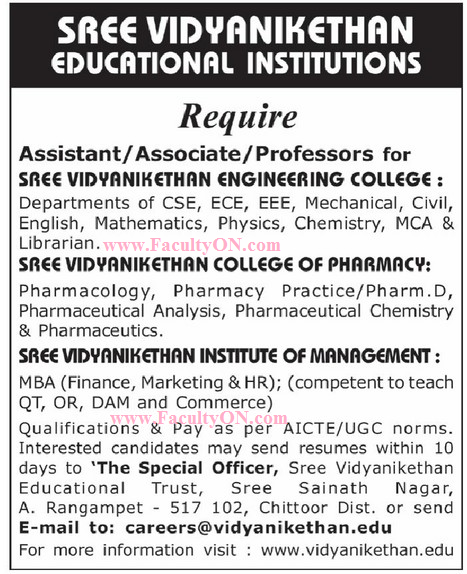 Sree Vidyanikethan College of Pharmacy, Chittoor has advertised in the EENADU newspaper for recruitment of Professor / Associate Professor / Assistant Professor jobs vacancies. Interested and eligible job aspirants are requested to apply within 10 days from 10th April 2018. Check out further more details below. About College: Sree Vidyankethan College of Pharmacy stands tall magnificently facing the Tirumala hills of the temple town of Tirupati. Approved by the All India Council for Technical Education (AICTE), New Delhi and Pharmacy Council of India (PCI), the institution took shape in the year 2004. It is affiliated to Jawaharlal Nehru Technological University, Anantapur, Anantapuramu.